Preheat oven to 400°F and place a rack in the upper third of the oven. Bring meat to room temp and rub with cut garlic. Dress with rosemary, salt and pepper, and drizzle with olive oil to coat. Line a rimmed baking sheet with foil. Dress tomatoes with olive oil and toss with crushed garlic cloves, salt, pepper and thyme. Roast to burst tomatoes, about 20 minutes. Dress greens with lemon juice and lightly with olive oil. Add a little salt and toss in cheese. While the skillet heats, lightly toast split rolls to crisp. Cook beef until crispy and brown on both sides, 6-8 minutes for hanger steak, 8-10 for rib eyes; brown the edges too. Let stand 10 minutes, thinly slice. Assemble sammies: on the roll bottom, place greens and cheese, sliced steak, burst tomatoes and set roll tops in place. In Recipes-list.com we have selected the most viewed recipes from category - uncategorized . Enjoy the best recipes specially selected for you! 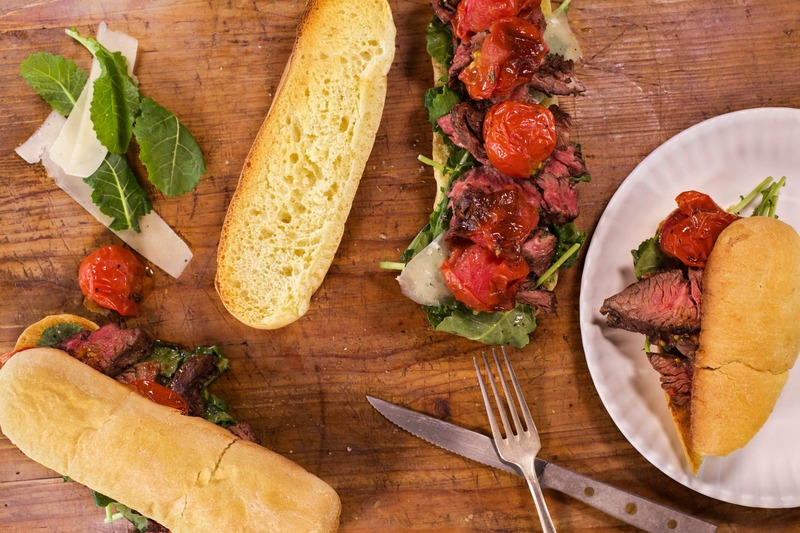 Sliced Steak Sandwiches with Roasted Tomatoes is the right choice that will satisfy all your claims.